Shakespeare scholar Harold Bloom explores one of Shakespeare’s most intriguing personalities with his book Cleopatra: I am Fire and Air. Bloom clearly appreciates the literary character and writes not only about the character as written, but also as performed by some of the bigger named or more famous actresses. Shakespeare’s Antony and Cleopatra is not one of his more popular plays and not performed nearly as often as some of his other tragedies and yet the enigmatic character of Cleopatra is instantly recognizable to most people and brings to mind a strong, sexual, sensual ruler of exotic persuasion. I have sometimes found Bloom’s writing to be annoying and even difficult to read, but that was not an issue here. Instead, Bloom pulled me in right away as he made the book immediately personal (“I fell in love in 1974 with the Cleopatra of Janet Suzman…”*) instead of didactic. And when he writes of “the ferocity of the most seductive woman in all of Shakespeare”* he is instantly identifying the appeal of the character and we know that Bloom’s examination comes not from a dispassionate professorial point of view, but something deeply felt. Other than Elizabeth Taylor’s portrayal of the role on film, which I saw far too long ago, I don’t know much about the play or the character. This examination brings to light a good many arguments for seeing this produced on stage (by a company that knows how to perform Shakespeare well). I was surprised in Chapter 15 by the look at the role of the Clown in the play. It was not surprising that the Clown provides insight – this is common in Shakespeare – but the sexual attitudes and the provision of the means of death coming through the Clown strike me as unique among the Shakespeare plays I have seen. More than ever I would like to see this play on stage and I tremendously appreciated this insightful look at the character. I look forward to more individual Shakespeare character examinations by Harold Bloom. Looking for a good book? 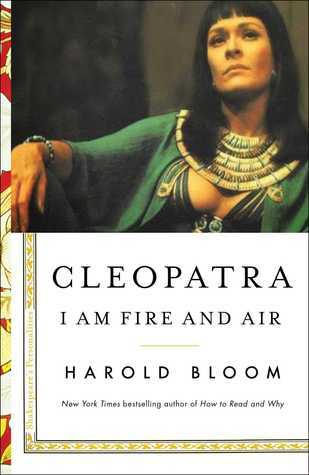 Cleopatra: I am Fire and Air is a wonderful examination by Harold Bloom of an exotic and strong character in Shakespeare’s canon. * All quotes are from an Advance Reader Copy of the book and may not represent the published edition.